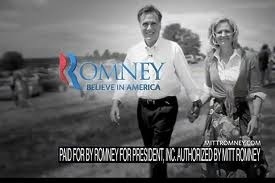 Mitt Romney released his first campaign ad. It’s not the ones we’ve seen from Americans for Prosperity or Crossroads GPS. It’s his. Take a look here. He says on day one he’ll do the following. 1. Approve the Keystone Pipeline, 2. Introduce tax reform, and 3. Begin dismantling and replacing President Obama’s health care law. A ridiculous pander to the hate-mongers of his party. Let’s dissect what that really means. 1. Screw the environment, the Keystone Pipeline is not all it claims to be. In the interest of safety: A rupture in the Keystone XL pipeline could cause a BP style oil spill in America’s heartland, over the source of fresh drinking water for 2 million people. NASA’s top climate scientist says that fully developing the tar sands in Canada would mean “essentially game over” for the climate. Romney and his party could care less about the health and well-being of our citizens. 2. Introduce tax reform is code for reduction of taxes paid by the 1%. These lunatics who support the Ryan Budget are totally full of crap when they say we must lower the deficit. 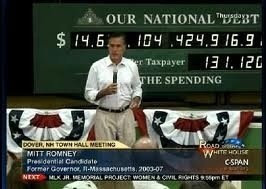 Romney’s latest gimmick of him speaking in front of a debt clock as if he gives a damn about debt is quite nauseating. Paul Krugman said Romney’s plan would greatly INCREASE the deficit, not lower it. 3. Obamacare. The carbon copy of Romneycare is now the enemy. God forbid people aren’t thrown off their insurance for pre-existing conditions or denied care altogether. Romney shows he’s flip-flopped to the side of the heartless hard right. As expected, Romney’s campaign is an insidious manifestation of greed, selfishness and destruction. Let’s make sure he never gets to show how much misery he plans to inflict on an already hurting America. Vote Democratic! Previous Post Why Does the Party of God Hate Women and the Poor? Great post. You are so right, this puppet of the tea party is frightening!